The world of wireless data communications is still dominated by revenues generated from text messaging. Picture messaging and all other data services still represent a fraction of the overall data traffic. With 3G networks being 2-3 year away from full implementation, slow adoption of 3G handsets and lack of compelling data applications carriers worldwide are increasingly looking at SMS Text Messaging to increase the revenues from data services. All this is with good reason. 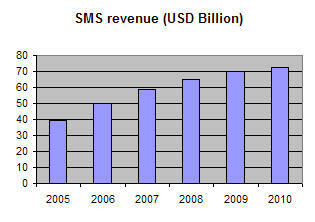 While worldwide revenues from SMS reached US$ 50b in 2006 they are expected to grow another 20% annually for the next 3-4 years (according to a recent Gartner study). 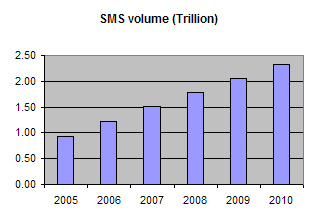 SMS volume is expected to more than double in the same period (to over 2.3 Trillion messages!!). The problem is, however, that there is no true international interoperability and even the largest service providers cannot establish and maintain fully connected, redundant network connectivity. To maintain such a network is expensive and requires superior technology, constant network monitoring and continuous contract extensions and maintenance. In addition, service providers can only offer person-to-person, handset-to-handset messaging. There are no alternative user interfaces available to extend the use of SMS to PC-to-Mobile. Also, there is also a void in available corporate applications, lack of defined API's and SMS plugins for popular enterprise applications such as IM and Microsoft Outlook. Whatever your market Reseller SMS solution can help you generate profits from the local and international SMS traffic within days. Please click below for some of the frequently asked questions and in-depth answers. How does Reseller SMS work? What is the business proposition (revenue model)? How is the service administered? How do my users access services? For full list of frequently asked questions please click here.